No one believes her, but Daisy Bauer knows her dad has been wrongfully imprisoned and that it's up to her to break him out of jail (aka Club Fed). She has a plan that she's calling the Graham Cracker Plot because it was all Graham's idea. She just needs a miniature horse, a getaway truck, and a penny from 1919—the idea coin. This funny, nail-biter of a novel is about friendship and admitting you're wrong. Debut novelist Shelley Tougas balances humor and warmth against themes of family, broken trust, and unconditional love against all odds. 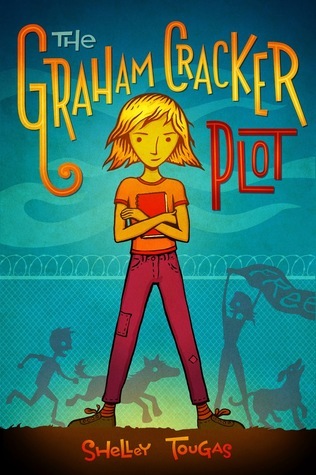 The Graham Cracker Plot is a fun, action-packed middle grade novel about a girl who will do anything to get her father out of prison, including coming up with a complex plot to break him free. In true middle grade fiction fashion, Daisy's story is an implausible, exaggerated, humorous adventure that both boys and girls will enjoy. Daisy and her friend Graham are joined by family friend Ashley, a dog, a pony, and a magical coin, as they attempt to break Daisy's father "The Chemist" out of prison. Things that make me a little queasy about this book: Daisy's "plan" is innocent enough. I mean, who wouldn't want their father out of prison, especially when you think he's innocent? Daisy is not old enough to realize that things like magical coins don't help in real life. But I'm still not sure how I feel about the reference to "cooking" drugs in a middle grade novel. If I had a twelve year old who read this book, then came to me for an explanation, would I be prepared to explain? I think of middle grade novels as having a hint of innocence to them, and the drug references seem like a stretch in an otherwise age-appropriate book. Throughout the novel, Daisy, Graham and Ashley do a lot of stealing as a result of their plan, but in the end they seem to learn their lesson and become better people as a result, so that didn't really bother me. I don't think kids are going to copy their plan or anything like that. Still, I don't entirely like how the drug issue was the catalyst for the humor instead of being handled with sensitivity. As an adult, I find myself wondering about mixing serious issues with the outrageous plan, but I think middle grade kids will definitely learn something from Daisy by the end.